What started as a lone art fair in the Miami Beach Convention Center in 2002, Art Basel Miami Beach has since erupted into a week-long fête of mega satellite art fairs, parties, panel discussions, intimate gallery events, charity galas and more. And of those satellite exhibits, few have made more of an impact, or done more for the art community, than Superfine! Miami Beach. Started by artist James Miille and arts entrepreneur Alex Mitow in 2015, Superfine! Miami Beach was created as a reaction to what both industry veterans saw in the art world: a lack of diversity amongst the upper echelon of artists, and price points that made quality art inaccessible for a large community of art lovers. Answering that dilemma, the pair started collecting a diverse group of emerging and established artists from across the globe. 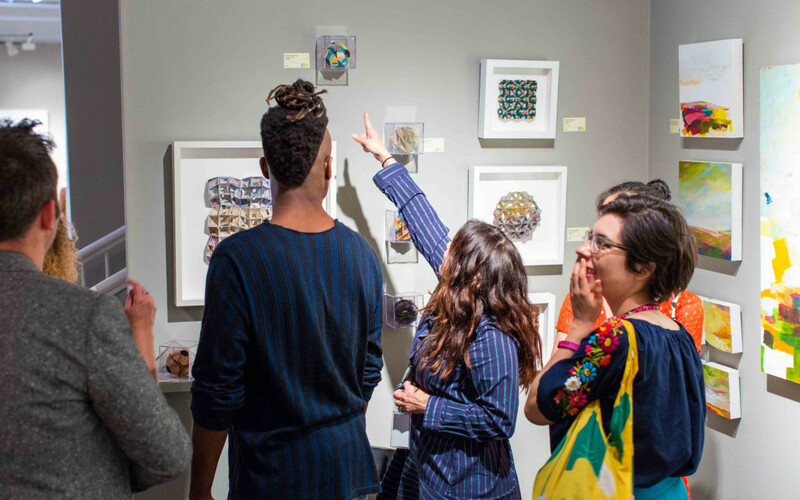 Just four years after its debut, the impact of the fairs art and artists have led Superfine! to grow in both popularity and prominence; and Superfine! now appears four times annually across the nation: in Washington D.C., Los Angeles, New York City and of course, Miami Beach. Returning the first week of December 2018, the fourth-annual Superfine! Miami Beach will run from Wednesday, December 5th to Sunday, December 9th. Fully committed to making the art world accessible to everyone, Miille and Mitow have accumulated art created by every kind of artistincluding a large concentration of artists of color, female artists and LGBTQ artistswith art ranging from $100 to $15,000 apiece. Staying in line with current events, Superfine! Miami Beach will also host performance art, special events and panel discussions related to environmental issues and inclusivity. Like any momentous weekend, Superfine! Miami Beach will kick-off with a ribbon-cutting ceremony led by Miami Beach City Commissioner, Michael Góngora. Over the next four days, 48 booths of art and photography by emerging and established artists alike will be open to the public, with all pieces available for sale. Exhibitor highlights include: local artists from Laundromat Art Space, LA's In Heroes We Trust and Claudia Huiza Presents. Solo artists like Adam Christopher Reed and Benoit Izard will showcase cutting-edge contemporary art, while an exhibition by artist duo StrosbergMandel will explore pop-surrealist themes. No matter your interest, all art at Superfine! Miami Beach is accessible and approachable for collectors in every stage of the game. Unlike typical art fairs, every piece of art is clearly priced, and all artists with a booth are required to include art priced between $100 and $900, and the price cap for any piece is $15,000. (On top of that, only 5-10% of all the works in the fair can be priced between $10,000 and $15,000. About 90% of the pieces are priced below $5,000.) Aiding this accessibility, Superfine! Miami Beach continues to use innovative purchasing tools like Art Money, a line of credit used exclusively for buying art, to make collecting even more approachable for all. Throughout the weekend, attendees can look forward to a roster of special events and expert-led panel discussions addressing critical issues impacting todays society. Three such panels, collectively dubbed Panels in the Park, will take place in Lummus Park, right next to Superfine! Miami Beach. On Thursday, December 6th, Maria Elena Ortiz, Associate Curator at Perez Art Museum Miami (PAMM), will teach listeners how to build a museum-quality collection at home. Then, on Friday, December 7th, Art on the Front Lines of Climate Change will bring together forward-thinking community leaders, climate change activists and artists, like Monica Jahan Bose and Alex Zastera, to discuss climate change and how the art community has reacted to it. The discussion will follow with an art performance from Bose titled RISING UP, which uses saris from Bangladesh and natural materials found on Miami Beach; two parts of the world that are feeling the immediate effects of climate change. Finally, an artist advice panel hosted by Marina Press Granger, of The Artist Advisory, will cap off Panels in the Park. Discussions aside, Superfine! Miami Beach will also start this years fair with its annual opening-night Champagne toast and Twilight Vernissage. Offering a first look at Superfine! Miami Beach, Twilight Vernissage is set to be a whimsical, one-night-only soirée with performance art by New York artist Veronika Rabinovich, of Dream Caverns, and live music from celebrity saxophonist, Leon Morley. On Friday night of Superfine!, guests are invited to attend Young Collectors' Ice Cream Social, a one-night series of LGBTQ+ art films curated by the OUTshine Film Festival. For times and additional details about these special events and panel discussions, click here. Superfine! 2018 will run from Wednesday, December 5th, to Sunday, December 9th at the Art Deco Welcome Center, which is located at 1001 Ocean Drive.Tickets are priced between $8 and $50 per person. Click here for more information, or to purchase tickets for this years fair or events.